RPF - Railway Protection Force has released the admit card for examination of Water Carrier Safaiwala Washer man & more posts.. There are total 798 vacancies for this job. Exam for this post(s) will be held in April Month 2019. 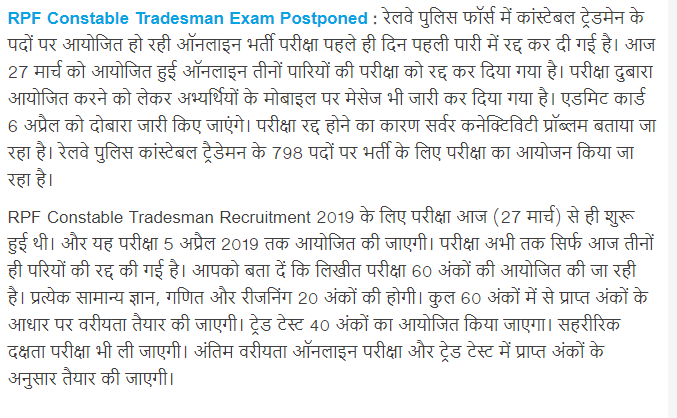 Railway Department are Invite for RPF Constable/SI Recruitment for 9739 Post. This Recruitment exam is Divided with Group. A, B,C,D,E. In Group A (SR, SWR & SCR) and Group B (CR, WR, WCR & SECR), Group D (NR, NER, NWR & NCR), Group F (RPSF (Male Candidates only) Now Download Result Group C & D.
RPF SI Result 2019:- Railway Protection Special Force Has Been Releasing the RPF Constable Group E, F Results. RPF SI Group E ,F.
The Railways Recruitment Board has released the Answer Key of RPF SI exam. Railways Recruitment Board has been also released the answer sheet of RPF SI gropu A,B,C & D exam on the official Website. First you need to go on official website https://rpfonlinereg.org (given blow important link section). When you click on "Result" option then New Page will be open. Details of abbreviations : CR= Central Railway, ER=Eastern Railway, ECoR=East Coast Railway, ECR=East Central Railway, NR=Northern Railway, NWR=North Western Railway, SR=Southern Railway, SCR=South Central Railway, SER=South Eastern Railway, NCR=North Central Railway, NER=North Eastern Railway, NFR=North East Frontier Railway, SECR=South East Central Railway, SWR=South Western Railway, WR=Western Railway, WCR=West Central Railway.